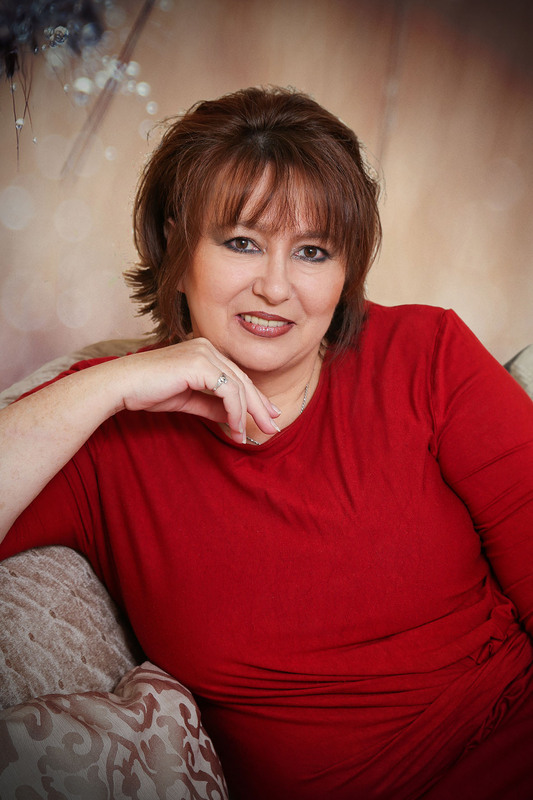 Narelle, it’s so good to be back on your blog again and I’m excited to whisk your readers away for the weekend (and on my subsequent two blogs) to the southern part of Finland, not that far from the Russian border. My husband, Noel, and I were privileged to take kesämökki (vacation at summer home) after my son, Kyle’s wedding in Finland in 2012. 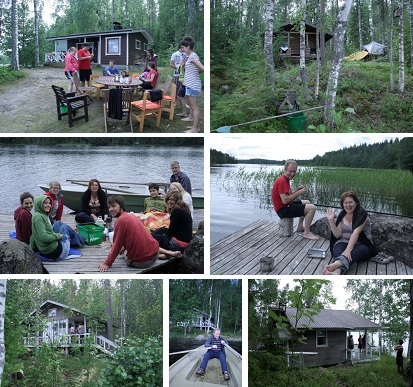 While Kyle, and his bride, Tiia, were on honeymoon, we spent ten days with new friends at their summer cottage beside a lake. Joining us were eleven of the bride and groom’s friends from missionary training who had come from all over the world—South Africa, Sweden, Austria, Switzerland, Italy, Germany, France, England, Canada and the USA—to Finland for the wedding. Noel loves to go fishing and had a great time on the lake catching Pike. Once he knew that the smaller fish were a Finnish delicacy, he had an excuse for catching them. Mimi from France insisted on ‘olding the Pike (she couldn’t pronounce her H’s which we thought was really cute), while fellow South African, Christo, thought the little fish were really fun. and the cottage Noel and I stayed in, about a hundred meter walk through the forest or a five minute row on the lake to get to it (and on which I modelled the cottage in my novelette, Helsinki Sunrise). 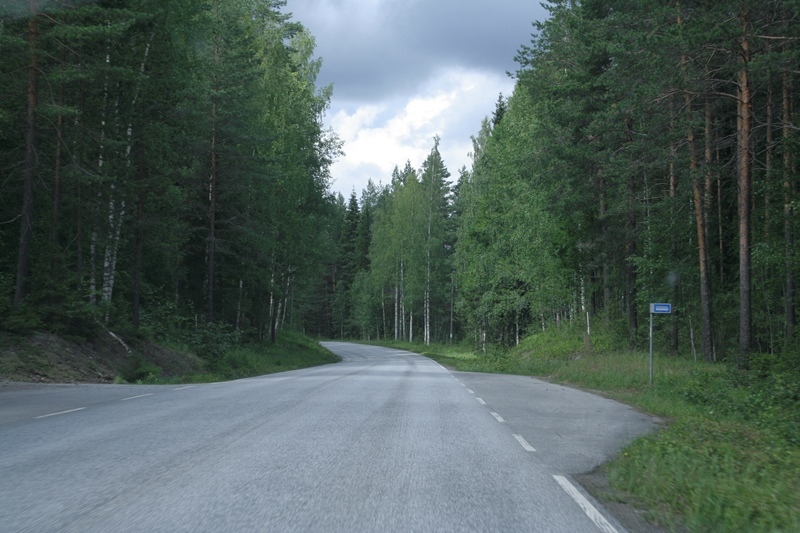 The drive into Savonlinna was on long tree-lined roads (just like everywhere else in Finland). On one such road, we found this crazy bus stop. It tickled us no end, and Noel just had to try it out. I can imagine that some old man or lady who got tired of standing while waiting for the bus and so placed the chair there for their comfort. 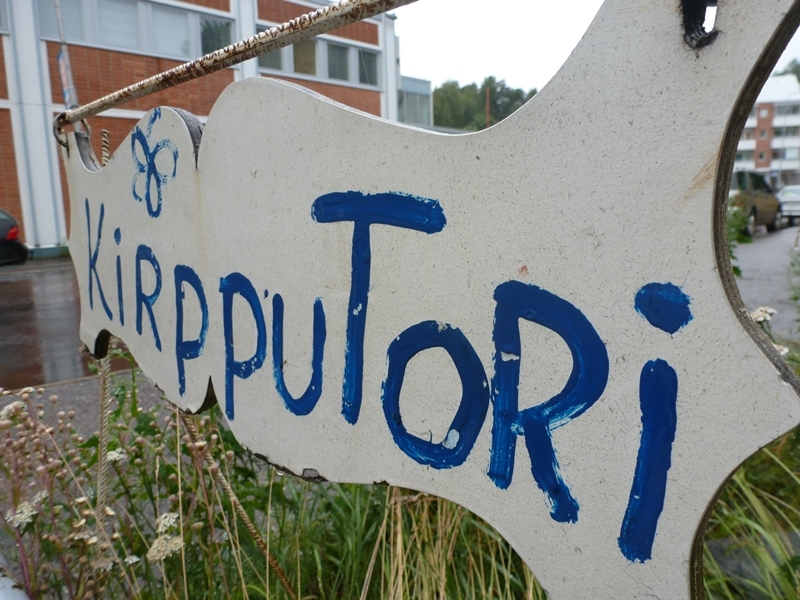 Another part of Finnish life and culture are the Kirpputori, or Kirpes for short. We’d know them as second-hand shops. We spent hours hopping from one to the next, finding the most amazing bargains. They carry mostly clothing, but also household knick-knacks, too. I bought myself a long woolen coat, made in England, for 5 Euro. I doubt it had been worn more than half a dozen times, if that, and I’d estimate it would be worth around 200 Euro. Don’t you just love it when you find a bargain? It certainly is going to be very useful when we go to Finland and Hungary in December. 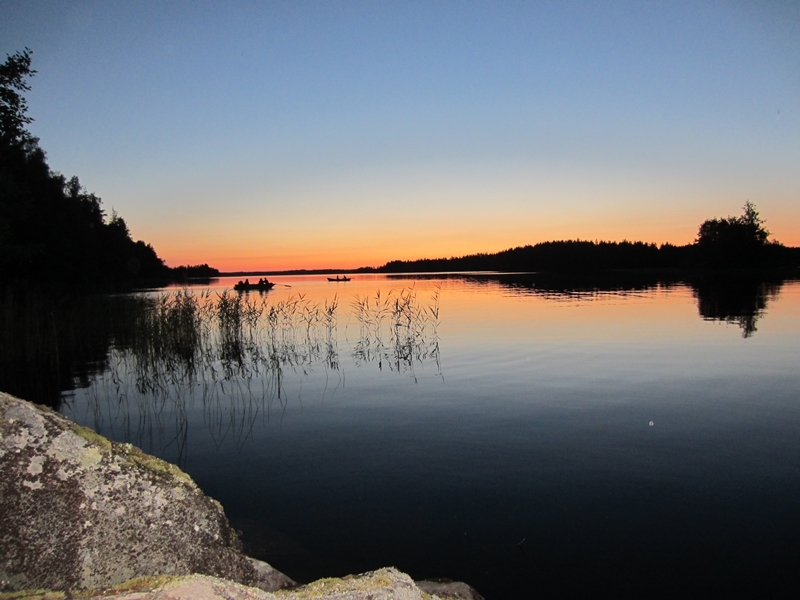 These were the midnight sunsets that bade us goodnight during our Finnish summer cottage vacation. I do miss them and hope I get to experience them again one day. On November 21st I’ll take your readers to explore the town of Savonlinna, the Ovanlinna castle and the annual Opera festival. It was all so fascinating. Mariion, you did such a good job of portraying place in Helsinki Sunrise. Fun to read here about your own experiences. I love the sunrise picture especially. Great post. I loved seeing all the pics! Finland sounds like such an awesome place to visit. Thanks for sharing. Lars, thanks for stopping by 🙂 Marion, thanks for visiting my blog and sharing Finland with us.